DALHART, Texas (February 16, 2015) – Approximately 10,560 acres of farmland between Dumas and Dalhart will be offered at auction Thursday, March 26. Schrader Real Estate and Auction Company will market the property and manage the event, in cooperation with Paul A. Lynn & Associates LLC and Glenn Cummings Real Estate. 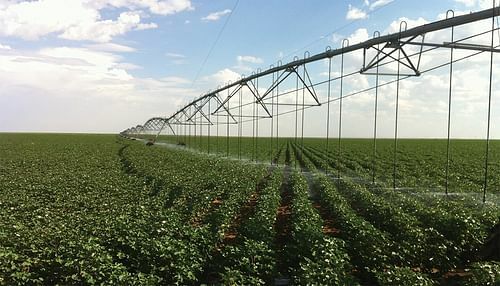 The land, including nearly 7,000 irrigated acres, will sell in 10 tracts ranging in size from 640 acres to 1,920 acres. The land is located in Hartley and Moore counties, approximately 15 miles northwest of Dumas and 20 miles southeast of Dalhart. Bidders will be allowed to bid on individual tracts, any combination of tracts or the entire property, Diehm said. Online bidding will be available for bidders who register by one week before the auction date. The auction will begin at 10 a.m. Thursday, March 26, at the Rita Blanca Coliseum in Dalhart. Schrader personnel will be available from 10 a.m. to noon Monday, Feb. 23, and Thursday, March 12 at the Dumas Hampton Inn to provide detailed information and accommodate inspections. Additional detailed auction information is available by visiting www.schraderauction.com or by calling 800-451-2709. Schrader Real Estate and Auction Company, based in Columbia City, Ind., is a leading auctioneer of agricultural land throughout the United States and is a four-time USA Today/National Auctioneers Association Auction of the Year Winner, as well as a two-time winner of the Grand Champion Marketing Award of Excellence.